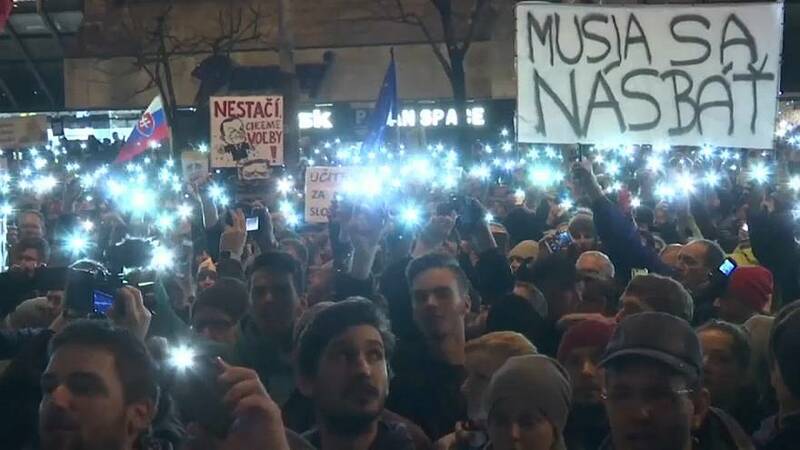 Tens of thousands of people took to the streets of Slovakia on Friday to demand snap elections following the murder of an investigative journalist. The crowd carried slogans such as "Slovakia is going the wrong way" and "We want elections". Journalist Jan Kuciak and his fiancée Martina Kusnirova, both 27, were shot dead at their home last month. Their killings triggered a political crisis that led to Prime Minister Robert Fico to resign on Thursday. But his party will remain in power after it rejected calls for an early election. Protesters rallied in dozens of towns and cities across Slovakia amid public anger over the government's failure to tackle corruption and cronyism. Nobody has yet been charged with the two murders.